This is my second try in making a laptop from scratch. Boy, it was kind of tiring for me. But I'm really satisfied with the finished product, although it seems a little weird. Yeah, the buttons are so not-keyboard-like, but I wanted to be creative and do something different. The scenery outside the window is stock photo, obviously, and the desk, notebook, laptop, the box, and the pendant were made from scratch. Blending options is your friend and I experimented a lot just to get things right. Choosing the pictures was easy enough. 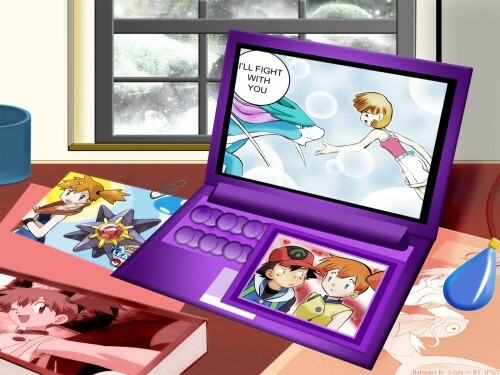 The laptop here is in Screen Saver mode and it's featuring Misty and Suicune. As you can see, there are lot of Misty in this because she's my favorite in Pokemon. Browse Pokémon Gallery: Recent | Popular.